Virtual worlds, simulations, and games are used in training and education in ever-expanding applications which seek to create learning experiences. Welcome to an interview with Patrick Mileham,director of editorial development for NexLearn (http://www.nexlearn.com). What is your name, your position, and your affiliation and what is your involvement in NexLearn? I work closely with our partners to develop relevant, instructionally sound training experiences. What is NexLearn and what is its mission and vision? NexLearn is a custom e-Learning developer with expertise in creating immersive learning simulations. In fact, the core group that started NexLearn developed some of the first business-related e-Learning courses to include branching social simulations. Most of the company’s team members have been involved in the development of e-Learning tools or courseware for more than 15 years. We definitely excel in industry experience and knowledge. The company’s mission evolved from its vision statement: “To advance excellence in learning technologies by combining people, technology and great ideas.” Once we decided where we wanted to go as a company, we outlined the best and most effective way to get there. By leveraging our creativity, experience and innovative development philosophy, we knew we could build strong customer relationships that would allow us to lead the technology-based education industry. What new products and services do you have? 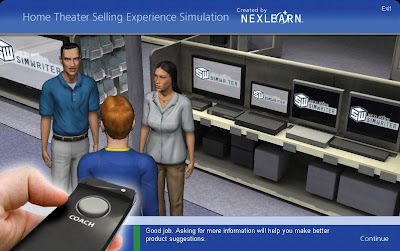 In 2006, NexLearn introduced SimWriter, a simulation authoring tool that gives anyone—including instructional designers, subject matter experts, trainers, managers and human resources personnel—the opportunity to develop custom, media-rich immersive learning simulations based on their company’s own content, processes and procedures. And since the tool features pull-down menus and pick-and-click functionality, SimWriter users can focus on creating engaging and instructional storylines instead of computer code. SimWriter’s ease-of-use translates into a savings of many hours of development time, effort and money. Just last month (February 2009), we released SimWriter 3.5, the latest version of the authoring tool that includes more than 30 new enhancements. We believe it is the most robust and flexible rapid development immersive learning simulation authoring tool available today. And the feedback we’ve been receiving from SimWriter users—including experienced developers and people who are just starting to develop courses—proves that the popularity of immersive learning simulations continues to grow. In addition, NexLearn provides a full range of custom courseware development services. We can do everything from Knowledge Engineering to Video and Audio Production in our onsite studios. We have over 1200 immersive learning projects completed in the last 14 years, including some projects as long as 183 hours of instruction and as short as 30 minutes. What do you identify as the key new trends that have made NexLearn beneficial to people? Well, with the current state of the economy, we’re seeing more companies putting greater emphasis on training...including those that have downsized their workforce. It’s critical for corporate leaders to realize that training isn’t a luxury that’s only valuable when business is good. Employee training and development is an investment that is critical to the success of their business—especially when they’re asking more from fewer employees. Companies are searching for help to train and cross-train their employees effectively and efficiently. Business leaders and CLOs are attracted to NexLearn for a couple reasons. First, we offer SimWriter. Again, the benefit here is that the tool offers developers the capability to create customized, complex branching social simulations in a quarter of the time and at a fraction of the cost it normally takes to create the same project using other development methods and tools. And second, we’ve developed a unique and beneficial three-tier process for helping our partners succeed. For clients that have limited or no development resources to create their own training courses, NexLearn experts can create and maintain projects for them—from the spark of an idea during the initial brainstorming session, to instructional design, graphic design and media development, to the annual updates to ensure the course content is current. NexLearn is a full-service developer. The second option for NexLearn clients is a “we create, you maintain” plan. In this scenario, NexLearn develops the program but the client makes any updates to the course. This option would have been almost unthinkable just a few years ago, but with the availability of SimWriter, companies now have a tool that gives them more control over the development process. By doing more of the work, companies can save more money. Finally, companies that purchase SimWriter can take advantage of the “you create and maintain” option plan. Many organizations have qualified internal resources to be able to create their own training programs, we’re now giving them the ultimate rapid development tool they need to create high-quality, media-rich courses. How does NexLearn work? Can you provide one or two examples? As I mentioned earlier, NexLearn and SimWriter are a powerful combination that provide multiple options for companies interested in creating customized training that is engaging, interactive, and very effective. We believe that simulation learning is the best approach to training today. By creating life-like scenarios, learners can experience real-world processes, procedures and decision-making opportunities in a safe learning environment. In the real world, failure is not an option. In a simulated world, it’s a learning experience. This is an example of a customer service simulation created using avatars. This is an example of a sales simulation created using video to allow learners to evaluate both verbal and physical cues to respond appropriately. This example shows the unique SimWriter interface that allows users to view both the simulation map and the corresponding text and media components simultaneously. Optional question: How can NexLearn help develop human capital and resources? How can it contribute to a global economic recovery? The challenges of a waning economy, such as hiring freezes or layoffs—coupled with the fact that millions of baby boomers are preparing to retire—are forcing business leaders to maximize their human capital. To accomplish this feat, organizations must invest in the skills of their employees like never before. From soft skills like communication, negotiation, and leadership to more technical skills like equipment operation and even industry-specific compliance training, it’s critical to the success of every business that employees are well trained. We work closely with our partners to identify and develop the educational and training experiences employees need to do their jobs better, faster, and more effectively. Perhaps the worst thing a business leader can do right now is to pull the plug on employee training. By drastically reducing training opportunities, workforce skills will become stagnant and companies will lose their competitive edge. On the global stage, NexLearn and SimWriter contribute to the world economy by helping organizations develop custom training, which allows them to fill job vacancies that require specific expertise.